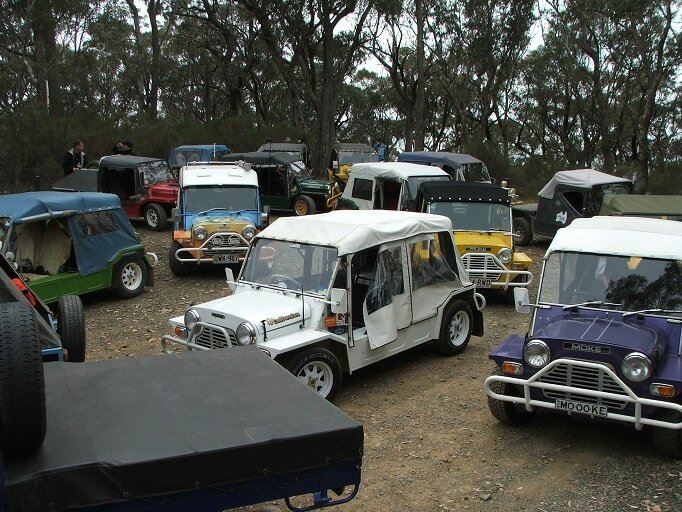 An easy late start for the early arrivals, we are letting everyone have a sleep in and will leave Moke Central around 9.30 - 10.00am for a drive around some scenic back roads with the highlight being a run up the Bungendore Spur Rd, which is an interestingly steep, scenic gravel road known only to a handful of locals. The destination is Bendemeer Hotel for lunch. This hotel is very family friendly and they have a huge area running down to the Macdonald River where the kids can run off some excess energy if the weather is good, or for the older folk to stroll around and stretch their legs. There is also the Bendemeer Pioneer General Store for those who just want a great coffee, sandwich or burger. After a lazy hour or two for lunch, we may split into two groups. From Bendemeer we have a choice of taking some scenic gravel roads back to Moke Central, or for those that have had enough dust for one day, it's very easy to get back home down the bitumen. Either way, the plan is to be back at Moke Central in plenty of time for Happy Hour. The plan for Thursday is to make our way out to a shady waterfront picnic spot approx 80km northwest of Tamworth for a picnic lunch/BBQ , then on to Mt Borah after lunch which offers some spectacular views. Mt Borah is famous as the venue for the National Paragliding championships. Those that don't want to do the Mount Borah leg (it does involve some gravel roads and a steep climb at the end, but well worth the trouble) will be given an easier alternate route home. The management of Moke Central (Austin Tourist Park) are going to continue their tradition of putting on a sausage sizzle for dinner on the Thursday night of the Round Up to welcome the earlier pre-weekend arrivals. It is what it sounds like - an Aussie sausage sizzle. So pieces of bread with sausages, onion and tomato sauce, although some of the Mokettes usually bring along a bit of salad. Nothing too flash, but has proven very popular in the past and a good ice breaker to get everyone together. Usually kicks off about 6.30, but we will confirm the time closer to the event. ​The plan here is to run up to Wallabadah First Fleet Memorial Park for morning tea, then on to Quirindi for lunch. The group will be split at Wallabadah, with one group heading out along an interesting back road with quite a few good water crossings, while the less adventurous still get a nice scenic run along the bitumen into Quirindi. Once we get to Quirindi we will be turning everyone loose to fend for themselves for a couple of hours. Quirindi is a small country town, with ample choice for lunch with several takeaways, coffee shops, pubs and an RSL Club. There are a few shops and other local attractions to keep everyone amused for an hour or two and once everyone has had a chance to eat and look around, we'll be heading back towards Tamworth via Werris Creek where we will stop to check out the Rail Worker's monument and the Railway museum, which is housed in the local historic Railway Station (c.1878). Worth a look for most people, and last time we visited we had to leave several railway buffs there when we moved on. From Werris Creek, there is again a choice of routes back to Moke Central - sealed or a combination of sealed & unsealed. This run will be familiar to those who attended the 2010 and 2012 Round Ups. We tried something different in 2014, however this only served to prove that, although it's been done before, Nundle is the best location for the Saturday trip. 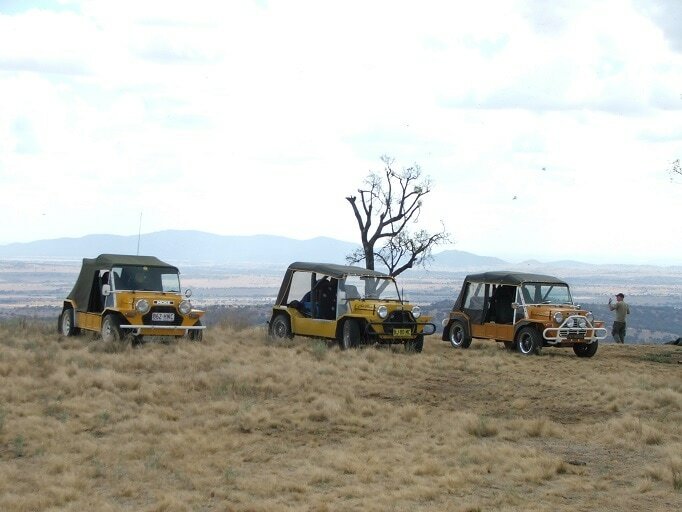 The basic plan is to head out from Moke Central, through Nundle to visit Sheba Dams and then on to Hanging Rock lookout which provides a fantastic steep windy Moke road, followed by spectacular views of the surrounding countryside from the lookout. We then head back down into Nundle for lunch. There are several choices here ranging from BYO in the local park with kids playground, to a take away shop, a coffee shop style cafe that does lunches, or the historic c.1860 pub which offers an inside dining room, beer garden out the back or you can sit at a table on the wide front verandah. Nundle is an old gold mining town. It's quite a small tourist driven town these days, which offers a couple of popular antique shops, a replica gold mine experience, and an historic woollen mill which has proven very popular with the crafty ladies in the past. We will give everyone a few hours to go and do their own thing before running the group back home to Moke Central. We have tried a few different ways to get the most out of this last day of the event in the past, but have agreed among ourselves that what we did in 2014 (the last Round Up) worked the best and would be hard to top, so we're basically doing it again . 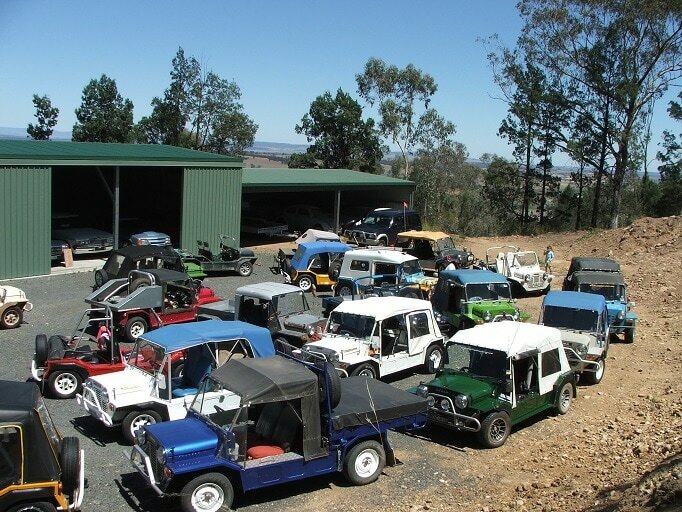 Plan is to have all Mokes do a lap of the main street, then head up to Tamworth Lookout. The idea here is basically to line them up and show them off to each other. People will be given time to wander around and admire each others vehicles and see what ideas are worth stealing to use on their own Moke. We will also be drawing raffles and making any presentations etc up there to basically wind the formal side of the event (such as it is) up. We don't run a show and shine or any sort of competition - this is as close as we get to that sort of thing. We will then head down for the obligatory tourist stop/photo op at the Golden Guitar. As well as a huge guitar you can get your photo taken in front of, it is also the site of the Tourist Info centre complete with souvenir shop, Country Music Wax Museum, and the newly opened Collectors Museum, which features Don Bradman and other cricket/sporting memorabilia. This is all conveniently located next door to a variety of eateries. Our recommendation is the Longyard Hotel, which has great meals and a fantastic outdoor family friendly beer garden. For those who want something simpler, there is also a McDonalds, KFC and Subway all within a minute or twos walk. It's at this point that we would suggest any poor folk who need to get home so that they can front up for work, school etc on Monday morning, could bid a fond farewell to their new and old Moking friends and head off down the road to home. 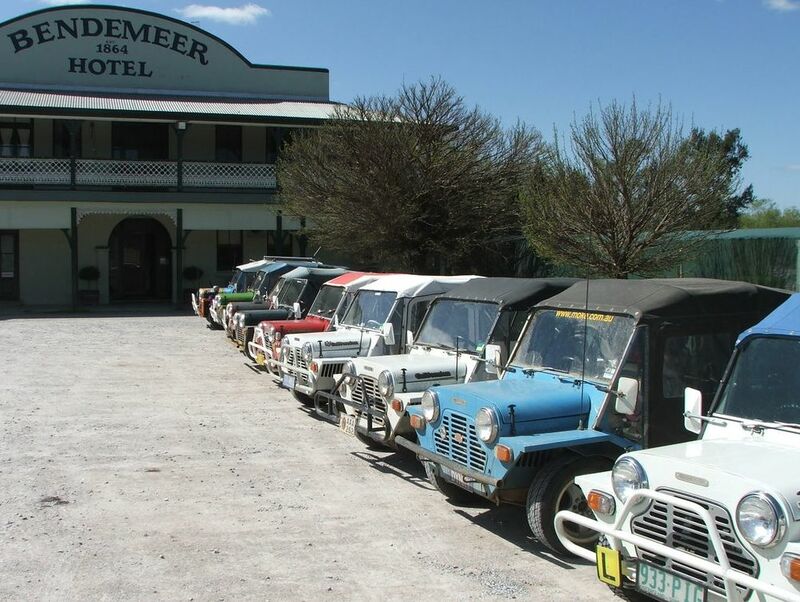 For those who still haven't had enough of Moking around the countryside, we will be running a short afternoon drive of maybe 2-3 hours - Dungowan to Kootingal via Mulla Creek, and then back to Moke Central. 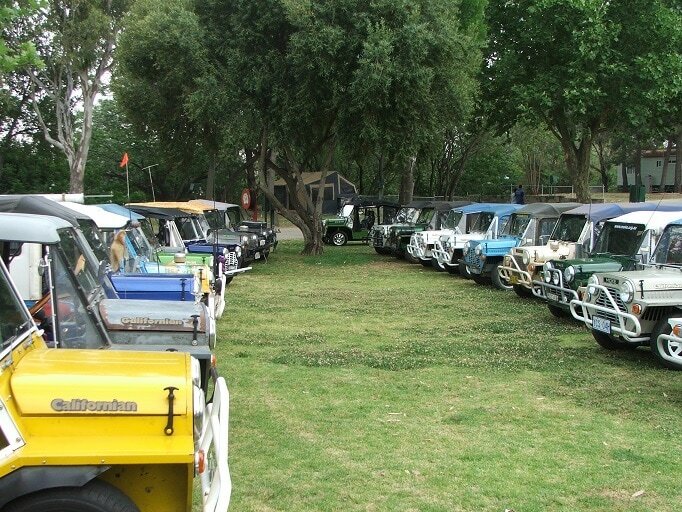 Don't forget to also read the "What to expect at the Moke Round Up" thread on the Moke Forum for a more general overview of what the event is all about.